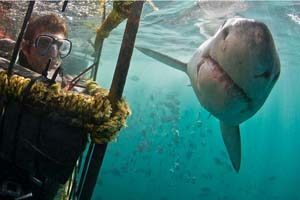 We have had some interesting times recently with the white shark cage diving. Some of the boats have been lucky enough to see Bronze Whaler / Copper Sharks at the bait line. There have been up to six different copper sharks at one time. Yes, you may think, ‘so what?’, but we have never had them at the bait line before and it was great to see new species around the boat especially as they are prey for the Great White Sharks. Last year we had many sightings of Stingrays on the summer trips so we are hoping to see more again this summer. Summer is here and we are having longer spells of sunny weather, but there is still the odd winter chill here and there. We had a big storm on the weekend which caused major floods in Cape Town and its surrounds. Fortunately it was only over two days and the damaged roads are being fixed and will hopefully be operational by end of week. We are spotting a mixture of small and large sharks daily with the largest shark being around 4.6 meters and an abundance of juveniles typically measuring around 3m. The small sharks are much livelier than the larger sharks and even though it is nice to see a large Great White shark, the smaller sharks offer much more spectacular action. The large sharks tend to cruise around as if they own the place, which they most likely do! The whales are still here although their numbers are thinning out as many of them have headed back towards the Antarctic. We are very fortunate in De Kelders as we get the last of the Whales along the coastline, so expect to still see whales for a few weeks to come. Hermanus activity has dropped considerably so if you want to see whales then come to Gansbaai side of the bay as you will stand a much better chance of seeing whales in De Kelders. We have been very busy with clients coming down from Durban shark week to see the White sharks. We had a spell of bad weather during some of their stay, but we always make a plan and filled this land-bound time with some excellent activities and had lots of fun. With the White shark season at a close now and the Seven Gill Sharks starting to come back in for the summer, it has been quiet in Cape Town. The Seal Snorkelling and diving tours have just started again for the summer and the Blue & Mako dives as well as the Seven Gill shark dive is now in season! I cannot wait to get back out on the water for the Blue & Mako shark dive as this is my favourite dive! The interaction between divers and sharks is second to none and the Blue Sharks are the most beautiful shark in the ocean, with their long slender bodies and huge saucer-like eyes. The seal diving trip is also an amazing dive with hundreds of seals in the water wanting to play! We will keep you updated about these dives through the summer, but if you have time then the Blue & Mako Dive, 7 Gill Cow Shark Dive and Seal Dive are a must! We have had a bad run of weather in Durban lately with rough seas and generally mid to low visibility. Summer is here now though and the water is warming up nicely so we are looking forward to an excellent season diving with the Tiger sharks on the Baited Tiger shark dive. Our shark week Durban packages are going well and despite the bad weather we are still managing to get out most days for our shark dives. The SA & Mozambique Shark weeks are in full swing with successful trips already running and sightings of Hammerhead sharks, Bull sharks, Manta Rays and many other rays. We have seen many clients combine the Shark Week Durban and SA & Mozambique Shark weeks with an extension to Cape Town to dive with the Great Whites. This is a must for most people as this extension is not very expensive. Besides, why come all the way to South Africa without popping down to see the Great Whites? The sardine run 2014 is still 8 months away, but before you know it, it may be too late to book your places for the 2014 season. Last year saw some excellent activity and we are really looking forward to the 2014 season from mid-June to mid-July.